Hello again, DevWars readers! Once again I'll be giving you a quick recap of last Saturday's DevWars shenanigans. Unfortunately, we were only able to host a single Zen Garden match, but it was still awesome! The Zen Garden theme was malls. Each competitor had to create the website for a mall. As usual, each warrior had only a premade HTML page and their own CSS. The two competitors this week were Krazune (blue) and Gavin (red). Krazune was new to DevWars, but he did an excellent job and held his own. Krazune had a nice simple layout. Gavin had some awesome hover animations and logos. Both of them had very similar hero images with buttons that were both well done. 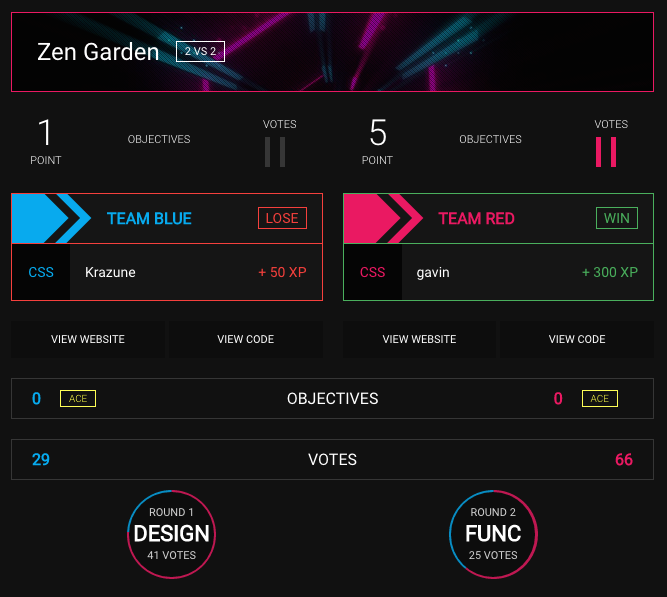 Also, if you haven't heard, we're now officially supporting the use of Sass in both the Zen Garden and Classic games! So if you're a Sass guru, stop on by. As for other preprocessor support in the future, only time will tell!